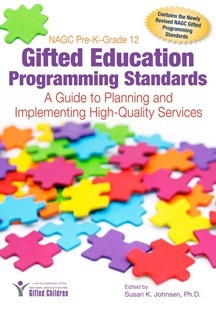 Why does gifted education need standards? Standards provide a basis for policies, rules, and procedures that are essential for providing systematic programs and services to any special population of students. While standards may be addressed and implemented in a variety of ways, they provide important direction and focus to designing and developing options for gifted learners at the local level. The Pre-K-Grade 12 Gifted Education Programming Standards were developed with input from a variety of stakeholders. The standards increase the focus on diversity and collaboration – two powerful principles that guide high quality programs and services. The standards use student outcomes for goals, rather than teacher practices, keeping them in line with the thinking in education standards generally. Because these standards are grounded in theory, research, and practice paradigms, they provide an important base for all efforts on behalf of gifted learners at all stages of development.